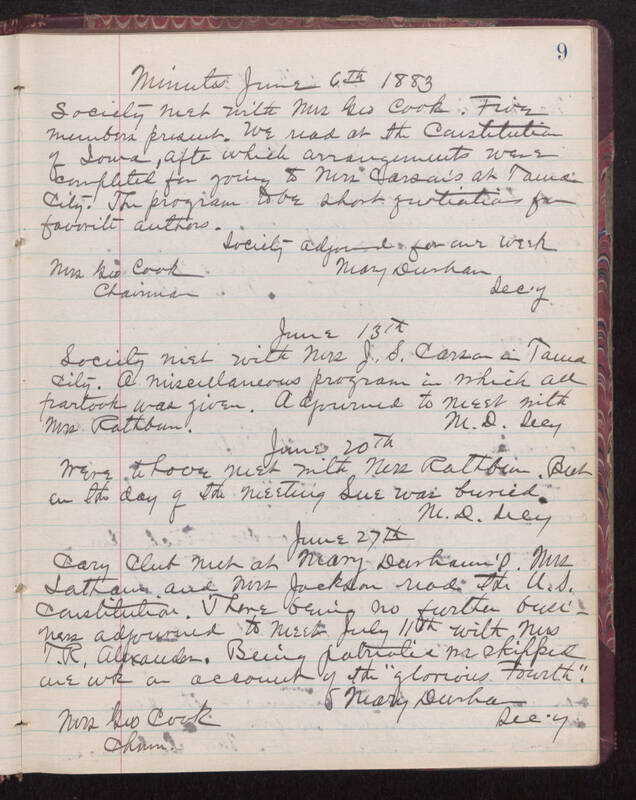 Minutes June 6th 1883 Society meet with Mrs Geo Cook. Five members present. We read at the Constitution Of Iowa, after which arrangements were completed for going to Mrs Carson's at Tama City. The program to be short quotiations from favorite authors. Society adjournd for our week Mrs Geo Cook Chairman Mary Dunhan Sec'y June 13th Society met with Mrs J.S. Carson in Tama City. A miscillaneous program in which all partook was given. Adjourned to meet with Mrs. Rathbun. M.D. Secy June 20th Were to have met with Mrs Rathbon. But on the day of the meeting Sue was buried. M. D. Secy June 27th Cary Club met at Mary Dunham's. Mrs Latham and Mrs Jackson read the U.S. Constitution. There being no further business adjourned to meet July 11th with Mrs T.R. Alexander. Being patriotic [illegible] skipped week on account of the "glorious Fourth". Mary Dunham Sec'y Mrs Geo Cook Chm.